The osprey differs in several respects from other diurnal birds of prey. Its toes are of equal length, its tarsi are reticulate, and its talons are rounded, rather than grooved. The osprey and owls are the only raptors whose outer toe is reversible, allowing them to grasp their prey with two toes in front and two behind. This is particularly helpful when they grab slippery fish. It has always presented something of a riddle to taxonomists, but here it is treated as the sole living member of the family Pandionidae, and the family listed in its traditional place as part of the order Falconiformes. To date there have been two extinct species named from the fossil record. Pandion homalopteron was named by Stuart L. Warter in 1976 from fossils of Middle Miocene, Barstovian age, found in marine deposits in the southern part of California. The second named species Pandion lovensis, was described in 1985 by Jonathan J. Becker from fossils found in Florida and dating to the latest Clarendonian and possibly representing a separate lineage from that of P. homalopteron and P. haliaetus. A number of claw fossils have been recovered from Pliocene and Pleistocene sediments in Florida and South Carolina. 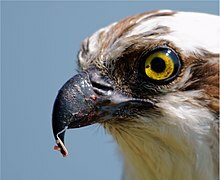 Fish make up 99% of the osprey's diet. It typically takes fish weighing 150–300 g (5.3–10.6 oz) and about 25–35 cm (9.8–13.8 in) in length, but the weight can range from 50 g (1.8 oz) to 2 kg (4.4 lb). Virtually any type of fish in that size range are taken. The newly hatched chicks weigh only 50–60 g (1.8–2.1 oz), but fledge in 8–10 weeks. A study on Kangaroo Island, South Australia, had an average time between hatching and fledging of 69 days. The same study found an average of 0.66 young fledged per year per occupied territory, and 0.92 young fledged per year per active nest. Some 22% of surviving young either remained on the island or returned at maturity to join the breeding population. When food is scarce, the first chicks to hatch are most likely to survive. The typical lifespan is 7–10 years, though rarely individuals can grow to as old as 20–25 years. European breeders winter in Africa. American and Canadian breeders winter in South America, although some stay in the southernmost U.S. states such as Florida and California. 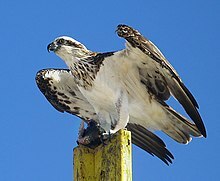 Some ospreys from Florida migrate to South America. 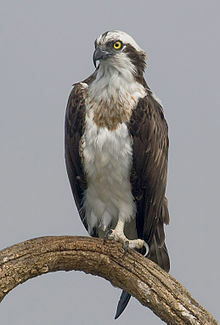 Australasian ospreys tend not to migrate. In 1994, the osprey was declared the provincial bird of Nova Scotia, Canada. It is also the official bird of Södermanland, Sweden. 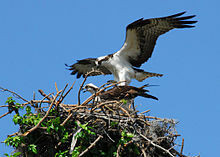 The osprey is used as a brand name for various products and sports teams. 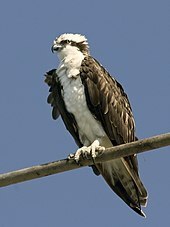 Examples include: the Ospreys (a Welsh Rugby team); the Richard Stockton College Ospreys (a NCAA Division III intercollegiate athletics team of the U.S. State of New Jersey); the first college in the nation (and the only one for many years) to adopt the osprey as its mascot and athletic team name, North Florida Ospreys (a NCAA Division I intercollegiate athletics team), the Missoula Osprey (a minor league baseball team); the Seattle Seahawks (an American football team of the National Football League); the Wagner Seahawks (a NCAA Division I intercollegiate athletics team); the Cold Spring Harbor Seahawks (a High school football team in Cold Spring Harbor, New York ); the Peninsula High School Seahawks (a High School Football Team in Gig Harbor, Washington); and the St. Mary's College of Maryland Seahawks (a NCAA Division III intercollegiate athletics team). ^ Olson, S.L. (1985). "Chapter 2. The fossil record of birds". Avian Biology. Vol. 8. Academic Press. pp. 79–238. doi: 10.1016/B978-0-12-249408-6.50011-X. ^ Mayr, Gerald (2006). "An osprey (Aves: Accipitridae: Pandioninae) from the early Oligocene of Germany". Palaeobiodiversity and Palaeoenvironments. 86 (1): 93–96. doi: 10.1007/BF03043637. ^ Livingston, C.H. (1943). "Osprey and Ostril". Modern Language Notes. 58 (2): 91–98. doi: 10.2307/2911426. JSTOR 2911426. ^ a b c Dennis, T.E. (2007). "Distribution and status of the Osprey (Pandion haliaetus) in South Australia". Emu. 107 (4): 294–299. doi: 10.1071/MU07009. ^ Monti, Flavio; Duriez, Olivier; Arnal, Véronique; Dominici, Jean-Marie; Sforzi, Andrea; Fusani, Leonida; Grémillet, David; Montgelard, Claudine (17 November 2015). "Being cosmopolitan: evolutionary history and phylogeography of a specialized raptor, the Osprey Pandion haliaetus". BMC Evolutionary Biology. 15: 255. doi: 10.1186/s12862-015-0535-6. ISSN 1471-2148. PMC 4650845. PMID 26577665. ^ a b Dennis, T.E. (2007). "Reproductive activity in the Osprey (Pandion haliaetus) on Kangaroo Island, South Australia". Emu. 107 (4): 300–307. doi: 10.1071/MU07010. ^ Hoffman, Glenn L.; Wu, L.Y. 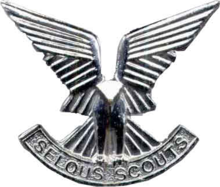 ; Kingscote, A.A. (1953). "Scaphanocephalus expansus (Crepl. ), a Trematode of the Osprey, in North America". The Journal of Parasitology. 39 (5): 568. doi: 10.2307/3273860. ^ Alerstam, T.; Hake, M.; Kjellén, N. (2006). "Temporal and spatial patterns of repeated migratory journeys by ospreys". Animal Behaviour. 71 (3): 555–566. doi: 10.1016/j.anbehav.2005.05.016. ^ Monti, F.; Grémillet, D.; Sforzi, A.; Sammuri, G.; Dominici, J.M. ; Bagur, R.T.; Navarro, A.M.; Fusani, L.; Duriez, O. (2018). "Migration and wintering strategies in vulnerable Mediterranean Osprey populations". Ibis. 160 (3): 554–567. doi: 10.1111/ibi.12567. ^ Klaassen, Raymond H. G.; Hake, Mikael; Strandberg, Roine; Koks, Ben J.; Trierweiler, Christiane; Exo, Klaus-Michael; Bairlein, Franz; Alerstam, Thomas (16 September 2013). "When and where does mortality occur in migratory birds? Direct evidence from long-term satellite tracking of raptors". Journal of Animal Ecology. 83 (1): 176–184. doi: 10.1111/1365-2656.12135. ISSN 0021-8790. ^ Washburn, Brian E. (2014). "Human–Osprey Conflicts: Industry, Utilities, Communication, and Transportation". Journal of Raptor Research. 48 (4): 387–395. doi: 10.3356/jrr-ospr-13-04.1. ISSN 0892-1016. ^ Ames, P. (1966). "DDT Residues in the eggs of the Osprey in the North-eastern United States and their relation to nesting success". Journal of Applied Ecology. British Ecological Society. 3 (Suppl. ): 87–97. doi: 10.2307/2401447. JSTOR 2401447.